The Liars Club: Hot Fun In The Summertime! This past Wednesday David Hulsey and I took Jake Moran to Noontootla Creek Farm to give him an idea of the variety of great outdoor activities available there. Jake is the Property Manager with Achasta Community near Dahlongega which has about two miles of the Chestatee River flowing right through the middle of it. Unicoi Outfitters is working with Achasta to develop a series of outdoor adventure type activities for their residents and guests that will include flyfishing classes, guided fishing trips, sporting clays and quail hunts. 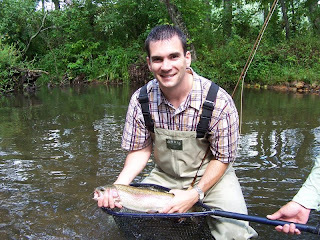 The rains we've had this summer have been a true blessing for trout fishing in north Georgia and, while stream levels are low compared with fall, winter and spring flows, the early morning water temperatures are holding steady in the low to mid 60's. 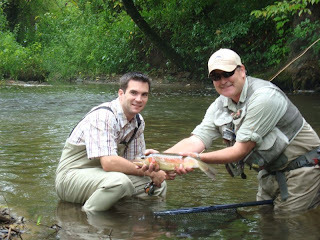 The exciting aspect of fishing in August is the opportunity to catch rising fish on big hopper patterns. There's not a much more exciting visual fishing experience than watching a huge rainbow swirl on a hopper, particularly when most of the rivers at this time of year are only fishing well with size 20 and 22 midges. Man, you can SEE a hopper out there! As you can see from the photos, Jake had a good morning at The Farm. We had a fantastic lunch at nearby VanZandt's Store. 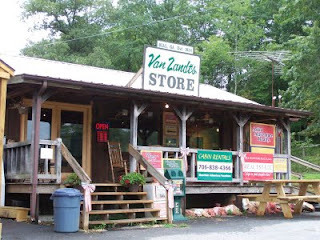 If you've fished the Toccoa River in the Dial community area, you're familiar with VanZandt's. It's actually been in business since 1834, long before the area was a playground for trout anglers, canoeists, hikers and bicycle riders. Manager, Greg Johnson has totally renovated the interior of the old store and offers up some rib-sticking meals with excellent chicken salad, stuffed baked potatoes and homemade pies. Take it from an expert, his chocolate pie will make your eyes light up and your tummy say howdy! When the Delayed Harvest season kicks off on November 1st, treat yourself to lunch at VanZandt's Store. Greg is also an accomplished fly fisherman and even has a few leaders, tippet spools and flies in stock just in case you find yourself on-stream without them.